In 1987, more than half (57 percent) of all U.S. cropland was operated by midsize farms that had between 100 and 999 acres of cropland, while 15 percent was operated by large farms with at least 2,000 acres. Over the next 25 years, cropland shifted away from midsize and toward larger operations. By 2012, farms with 100-999 acres held 36 percent of cropland, the same share as that held by large farms. That shift occurred persistently over time, as the share held by large farms increased in each Census of Agriculture after 1987—in 1992, 1997, 2002, 2007, and 2012—while the share held by farms with 100-999 acres fell in each census. Note that the share of cropland held by the smallest farms (with less than 100 acres) changed little over time, at about 8 percent of all cropland. 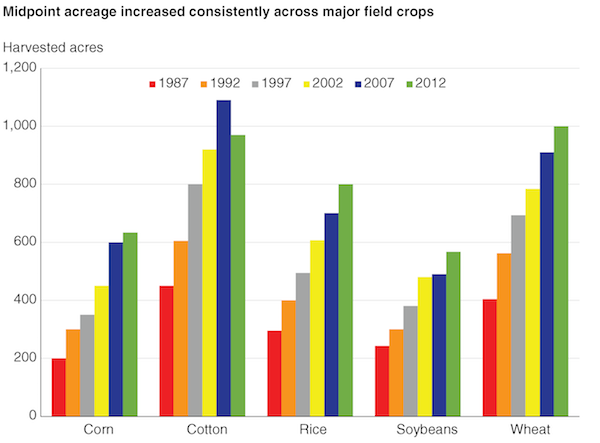 Shifts of crop acreage to larger farms occurred in almost all crops. To track consolidation in specific crops, we measured the midpoint acreage for selected crops in each census year. At the midpoint, half of all harvested acres of the crop are on larger operations and half are on smaller. In 1987, for example, the midpoint for corn was 200 acres—half of all harvested corn acres was on farms that harvested at least 200 acres of corn, and half was on farms that harvested no more than 200 acres. The corn midpoint increased in every census after 1987. By 2012, it stood at 600 acres. Four other major field crops (cotton, rice, soybeans, and wheat) showed a very similar pattern: the midpoint for harvested acreage more than doubled for each crop between 1987 and 2012, and the midpoints increased persistently in each census year (with the single exception of a decline in cotton in 2007-12). We repeated the analysis for 10 more field crops and for 40 fruit, melon, tree nut, and vegetable crops—a total of 55 crops in all. Consolidation was nearly ubiquitous, as the midpoint increased in 53 of the 55 crops between 1987 and 2012. Consolidation was also substantial, as most of these midpoint increases were well over 100 percent, and it was persistent, as most midpoints increased in most census years. Cropland accounted for 43 percent of all U.S. farmland in 2012, while pasture and rangeland accounted for another 45 percent. 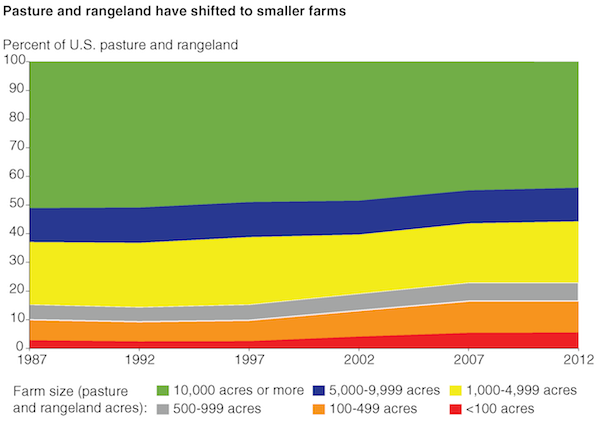 While cropland consolidated into larger farms between 1987 and 2012, pasture and rangeland did not, but instead shifted away from the largest farms and ranches and toward smaller operations. In 1987, farms and ranches with at least 10,000 acres of pasture and rangeland operated more than half (51 percent) of all pasture and rangeland, while those with less than 1,000 acres held 15 percent. By 2012, the share operated by the largest acreage class had fallen to 44 percent, while farms and ranches with less than 1,000 acres of pasture and rangeland operated 22 percent. U.S. farmland shows very little consolidation since the 1980s. However, that seeming stability reflects two diverging underlying trends: considerable consolidation in cropland and in crop and livestock production, set against shifts of pasture and rangeland toward smaller operations. Consolidation in livestock production follows a different pattern than that in crops. When it has occurred, it has not unfolded at a steady and persistent rate over time. Instead, livestock consolidation proceeded episodically, with periods of sharp change in the size of operations, followed by stability. As in our analysis of specific crops, we tracked midpoints for each livestock commodity across census years. We used a sales midpoint—based on the number of animals sold or removed during a year—for livestock feeding industries like broilers, turkeys, and fed cattle. We used midpoint herd or flock inventory values for egg layers and cows. Some shifts have been dramatic. For example, the midpoint milk cow herd in 1987 was at 80 cows—half of U.S. milk cows were in herds of at least 80 cows, and half were in herds with no more than 80. By 2012, the midpoint had increased more than tenfold, to 900 cows. Similar dramatic increases occurred in egg layers and in hogs and pigs, as each industry underwent striking changes in organization and farm size. 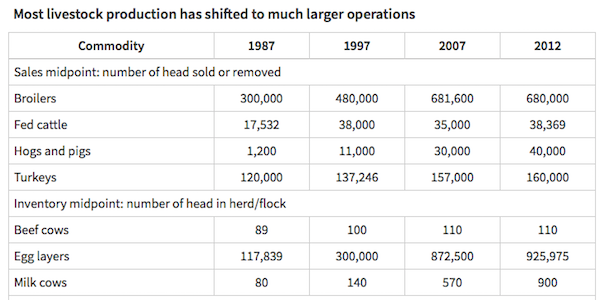 In other sectors (like broilers, turkeys, and fed cattle), production shifted to larger operations by 2012, but the shifts were not persistent, and there is little evidence of continuing consolidation in 2007-12. Major reorganizations of those industries occurred earlier, in the 1960s and 1970s, and the later shifts reflected further adjustments. One important sector shows little consolidation. The midpoint beef cow herd was at 89 cows in 1987, a bit larger than the midpoint milk cow herd. By 2012, the midpoint beef herd had increased, but only modestly, to 110 cows. Beef cow herds, and the calves that they birth, typically graze on pasture and rangeland, which showed no consolidation in the period. Other livestock, such as sheep, goats, and horses, may also graze on pasture and range—but cattle are the major users of what amounts to nearly half of all U.S. farmland. Hence, cattle grazing, and the pasture and range that they graze on, are an important exception to the strong trend toward consolidation in agriculture. So far, we have focused on specific livestock and commodities, and showed that acreage and production in most have consolidated into larger enterprises. However, most farms are diversified: those with crops almost always produce more than one, and while some livestock producers are specialized, most also grow some crops. Hence, a complete picture of farm consolidation requires that we look at all products on a farm, which we do by tracking consolidation in farm sales. We measure sales with gross cash farm income (GCFI), which represents all revenues flowing to a farm business from commodity sales, contract fees realized by raising crops or livestock for someone else, government payments, and “farm-related” income (such as land rentals, custom services provided to others, or insurance indemnities). Because GCFI can be affected by inflation in prices irrespective of any change in production, we adjust for inflation and report GCFI in 2015 dollars. We use USDA’s annual Agricultural Resource Management Survey (ARMS) for sales data, and can therefore extend the analysis through 2015. There is substantial consolidation in farm sales. In 2015, small farms with less than $350,000 in GCFI accounted for about 25 percent of the value of agricultural production, down from 46 percent in 1991. 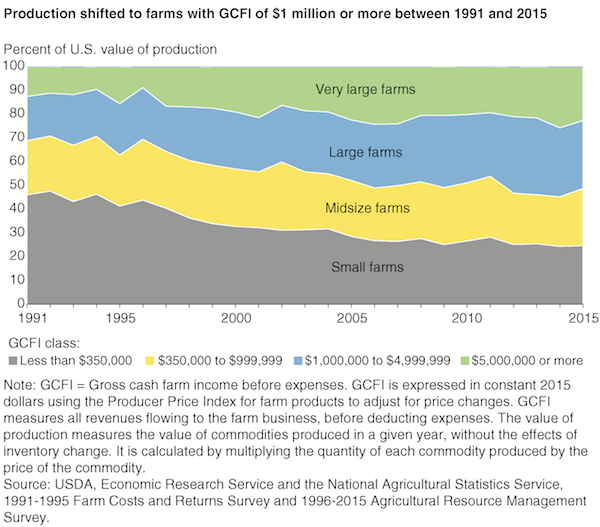 In contrast, farms with at least $1 million in GCFI accounted for 51 percent of all production in 2015, compared to 31 percent in 1991. The broad trend supports the evidence from the crop and livestock measures of a substantial shift of production to larger farms. However, note that much of the consolidation in sales occurred between 1991 and 2007, and it appears to have slowed considerably afterwards. This finding is consistent with the slowing of consolidation shown in most livestock sectors, and also with slowing consolidation in some crops. However, estimates of farm profits derived from ARMS indicate that larger farms continue to realize better financial returns than smaller operations, so we cannot yet conclude that the apparent slowing is more than a pause. Consolidation shows distinct patterns. It occurred in most crop and livestock sectors, but not in grazing and pastureland and not in the beef cow-calf sector. Consolidation proceeded steadily in crops, and more episodically in livestock, but was not concentrated in any single period. Technological developments in agriculture allow a single farmer or farm family to manage more acres or more animals than they could in the 1970s and 1980s, and these developments likely play an important role in consolidation. Specifically, larger, faster, and more precise tractors, planters, sprayers, and harvesting equipment reduce the time a farmer must devote to field tasks on a given acreage, freeing a farmer to manage more acres. Pest management innovations of the last several decades—such as chemical herbicides, genetically engineered herbicide-tolerant seeds, and seed treatments—also reduce labor commitments for field tasks. In livestock, the continued development of confinement feeding practices has been an important driver of consolidation. Producers moved poultry and hog production into climate-controlled housing, while dairy production and cattle feeding placed most animals in open barns and pens. Those shifts, combined with steady improvements in disease control, reproduction, and nutrition/feeding practices, allow producers to manage more animals while also realizing substantial improvements in productivity. Agricultural policy, in the form of USDA commodity programs, is directed primarily at field crops. If commodity policy was a dominant factor in consolidation, we should therefore expect consolidation to be concentrated in field crops. However, the patterns described above show that consolidation has occurred across a wide range of field and specialty crops, as well as livestock sectors. Another important USDA program, Federal crop insurance, has been expanded sharply since the mid-1990s; while there are policies aimed at specialty crops and some livestock sectors, the primary focus has been on field crops. However, since consolidation proceeded rapidly in many crop and livestock commodities, and before the mid-1990s, it seems unlikely that crop insurance could have played a dominant role. A family farm combines ownership and decision making in a single family. Specifically, a family farm is defined as one in which the person primarily responsible for day-to-day operating decisions—called the principal operator—also owns the majority of the farm business, either individually or in combination with relatives. Family farms account for 99 percent of all U.S. farms and 89 percent of agricultural production, and we see no reduction in those shares over time. Even among the largest farms, those with at least $5 million in sales, family operations accounted for 78 percent of farms and 73 percent of production. Nonfamily farms include many types of organizations. Many large nonfamily farms are partnerships among a small number of unrelated people, while others are operated by a hired manager on behalf of a family that owns the farm or a larger multifarm business. Large corporations do operate farms, particularly in poultry and hog production, but their primary role in agriculture is to coordinate supply chains through the provision of inputs to family farms, and by contracting with family farms to raise commodities. The dominance of family businesses is a distinctive attribute of U.S. agriculture and derives from several features of agriculture. While there are some scale economies in agriculture, most can be fully realized by family farms that remain fairly small businesses—enormous size is not necessary to effectively implement agricultural technologies. Agriculture often does require detailed localized knowledge (of soils, pests, and microclimates), and farmers must often act quickly and flexibly to weather conditions. Family business are well suited to develop localized knowledge and to adapt quickly and flexibly. James M. MacDonald is a branch chief at the U.S. Department of Agriculture's Economic Research Service (ERS). Robert A. Hoppe is an Agricultural Economist who started working at ERS in 1978. For the past 20 years, he's conducted research on farm structure.